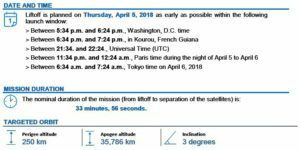 Arianespace’s third launch of the year took place on Thursday, April 5, 2018 at 6:34 p.m. (local time) from the Guiana Space Center (CSG), Europe’s Spaceport in French Guiana. With this 98th launch of Ariane 5, the heavy-lift launcher has now transported more than 200 satellites since its entry in service. DSN-1/Superbird-8 is the 19th satellite launched by Arianespace for SKY Perfect JSAT. SKY Perfect JSAT is the leading satellite operator in Asia, and plays a major role in the satellite broadcasting and telecommunications markets. 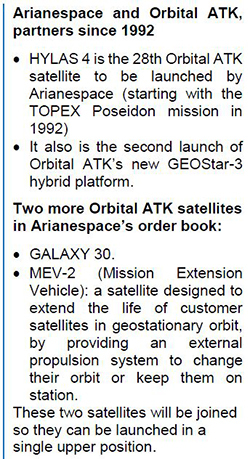 Arianespace has two more SKY Perfect JSAT satellites in its order book: Horizons 3e and JCSAT-17. Superbird-8 will provide telecom services, primarily for the Japanese market, and will replace Superbird-B2, launched by Arianespace in 2000. DSN-1 is an X-Band Defense Communications Satellite, in association with the Program to Upgrade and Operate X-Band Satellite Communications Function, for which the DSN Corporation, a subsidiary of SKY Perfect JSAT, has concluded a program contract with Japan’s Ministry of Defense. With this latest successful launch, Arianespace confirms its status as a benchmark launch services provider for the country’s two leading operators, SKY Perfect JSAT and B-SAT. Since launching JCSAT-1 in 1989, Arianespace holds nearly 75% of the Japanese geostationary satellite launch market open to competition. Arianespace has launched the entire operational fleet of British operator Avanti Communications. HYLAS 4 is the third satellite launched for this company by Arianespace, following HYLAS 1 (in November 2010) and HYLAS 2 (August 2012). The HYLAS 3 auxiliary payload, integrated in the EDRS-C satellite, will be launched as well by Ariane 5. At the forefront of Ka-band satellite communications in Europe, Africa and the Middle East, Avanti Communications’ HYLAS satellite fleet provides broadband Internet access via top service providers to homess, schools, Mobile Network Operators (MNOs) and governments. Thanks to its Ka-band capacity, HYLAS 4 will provide secure and reliable satellite communications services to Internet Service Providers (ISP), Mobile Network Operators (MNO’s), governments and satellite operators throughout Europe. This High Throughput satellite will also cover regions in central and western Africa, while its steerable spotbeams will enable it to cover Europe, the Caribbean, the Middle East and South America. With today’s Flight VA242 mission, the 98th completed by Ariane 5 since it entered service in 1996, Arianespace has now launched its 200th and 201st satellites with its heavy-lift launcher. This is a record for the Ariane launcher family, since the previous generation of Ariane 4 vehicles had orbited a total of 187 satellites during its entire service life. The 201 satellites were launched for 70 different customers, amounting to a cumulative total mass more than 775 metric tons. 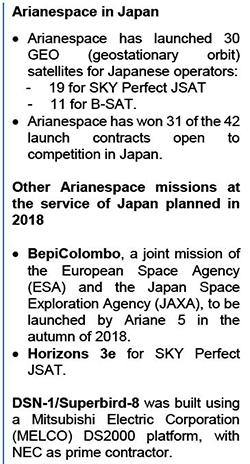 “Arianespace is very proud to serve our Japanese and British customers with this third launch of 2018. We are very honored by SKY Perfect JSAT’s ongoing trust in us, since we have launched 19 of their satellites since 1989; and by the trust of the Japanese Ministry of Defense. Congratulations go to Avanti Communications, which has entrusted us with the launch of all three of its satellites now in orbit. I would like to congratulate NEC Corporation and Mitsubishi Electric Corporation, builders of DSN-1/Superbird-8, and Orbital ATK, which built HYLAS 4. The DSN-1/Superbird-8 satellite was built on a DS2000 platform by Mitsubishi Electric Corporation (MELCO), with NEC as prime contractor. Once positioned at 162° East longitude, it will replace Superbird-B2, launched by Arianespace in 2000, and will cover Japan and neighboring regions. It weighed 5,348 kg. at liftoff and offers a design life exceeding 15 years. HYLAS 4 was built by Orbital ATK. It is a very-high-throughput Ka-band satellite, with 53 operational transponders and four gateway beams. Positioned at 33.5° West, it will provide broadband communications and connectivity services in Africa and Europe. It weighed 4,050 kg at liftoff and offers a design life of 15 years.